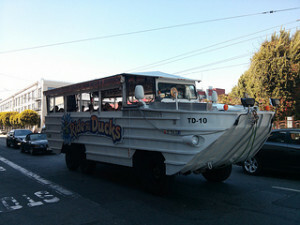 On Thursday September 24, a duck boat tour in Seattle ended tragically leaving four dead and dozens injured. According to the San Francisco Chronicle, the duck boat was carrying a group from North Seattle College across the Aurora Bridge when the amphibious vehicle suddenly swerved and crashed into a charter bus. The crash killed four international students. A woman from Fremont who suffered a broken collarbone was among the many injured in the collision. Critics of both sort point to the difficult safety record and the Chronicle article mentions several serious duck boat accidents. In 2010, two students died near Philadelphia after a tugboat pulling a barge crashed into a stalled duck boat, ultimately sinking the tourist-packed vessel. Last week wasn’t Seattle’s first duck boat accident either. There, in 2011, a duck boat ran into and dragged a motorcycle rider after coming up behind him at a light. Looking back further, the NTSB blamed inadequate maintenance for the sinking of a duck boat in Alabama during 1999, an incident that claimed thirteen lives. We love our region and love sharing it. As a San Francisco tourist injury lawyer, Attorney Greg Brod is concerned about the safety of visitors to the Bay Area whether they are riding a duck boat or enjoying anything else our city has to offer. Vacation injuries take many forms including rental car accidents, serious cases of food poisoning, and injuries stemming from defective rented sporting equipment. Although there are exceptions, usually a plaintiff files an injury lawsuit where the injury occurred. Our team understands that this can be difficult for the countless people hurt while visiting our region for business and recreation each year, especially after a serious injury or loss. We work hard to limit the number of times you have to return to the area to pursue your legal rights. In some cases, we can even resolve the entire matter without the need for an out-of-town client to return at all (or at least not for such an unenjoyable reason as pursuing an injury claim!). Call to arrange an in-person or telephonic consultation.